CHICAGO — Five of Chicago’s 14 candidates for mayor attended the Chicago Mayoral Arts Forum Sunday, a chance for hopefuls to lay out their intentions for maintaining and expanding the city’s commitment to the arts. In a Q & A format organized by Arts Alliance Illinois and moderated by Chicago Humanities Festival artistic director Alison Cuddy and Craig Dellimore, political editor at WBBM Newsradio, candidates Gery Chico, Lori Lightfoot, Toni Preckwinkle, Paul Vallas and Willie Wilson offered their ideas on maximizing the arts’ economic impact; diversity and equity across the city’s neighborhoods; and other topics ranging from non-profit status for arts organizations, the Percent-for-Art ordinance, and Lollapolooza. While each of the five candidates lauded the value of the arts and contributions of artists to our city’s economy, a variety of plans and ideas were floated as to how to accomplish universal goals of supporting local artists; leveling the playing field for arts education on the South, West, and Southwest sides; and maximizing the two-pronged economic impact of the arts through investment by tourists and local Chicagoans. 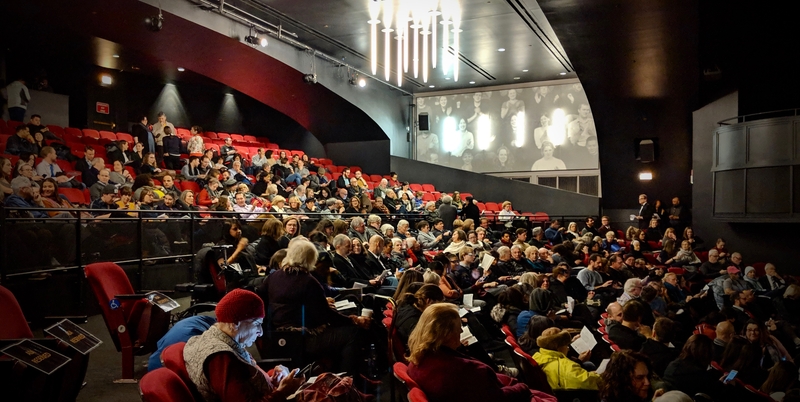 Attendees gather prior to the 2019 Chicago Mayoral Arts Forum at Broadway In Chicago’s Broadway Playhouse. Photo by Zachary Whittenburg. In a nutshell, there was unanimous agreement that it is time to refresh the 2012 Chicago Cultural Plan, with a renewed commitment to diversity and equity across Chicago’s 77 neighborhoods. And all candidates present emphatically disagreed with the idea of eliminating tax exemptions for arts organizations and committed to continue the Percent-for-Art ordinance, a public art initiative administered by DCASE. As for specific areas of emphasis, Paul Vallas expressed a passion for art therapy and the development of a community-driven arts advisory council, empowering artists to inform and advise City Hall as to the priorities of the arts community. Tony Preckwinkle, Gery Chico and Lori Lightfoot advocated for improved arts education in public schools that are currently not meeting standards of excellence, with Lightfoot proposing artist-in-residence programs in schools. Lightfoot also laid out a plan to gradually increase the hotel tax and commit this revenue to support artist grant programs. Toni Preckwinkle suggests an audit of granting structures to ensure that it is not just the largest institutions who are receiving a majority of DCASE grant dollars. Willie Wilson proposed lowing taxes and hiring a marketing firm with satellite offices around the world to draw tourism and cultural engagement in the city, and committed to fighting corruption at City Hall. And Chico noted the importance of big events such as Taste of Chicago and Lollapolooza, and how, as the former board president at the Chicago Park District, he used revenue from these events to subsidize camp tuition at the parks. Header photo: 2019 Chicago Mayoral Arts Forum at Broadway In Chicago’s Broadway Playhouse, from left: Candidates Paul Vallas, Toni Preckwinkle, Gery Chico, Willie Wilson, and Lori Lightfoot; Brooke Flanagan, Arts Alliance Illinois Board Chair and Managing Director for Advancement and External Affairs at Chicago Shakespeare Theater; and moderators Alison Cuddy, Marilynn Thoma Artistic Director of the Chicago Humanities Festival, and Craig Dellimore, Political Editor at WBBM Newsradio. Photo by Zachary Whittenburg.